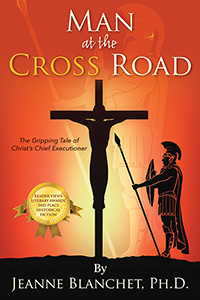 Jeanne Blanchet, Ph.D.’s “Man at the Cross Road.” A gripping story of Marcus, the head of the death squad that crucified Jesus, after he meets believers in the Messiah and witnesses the Lord’s Supper. A message of love and salvation works a change in the dissolute thug’s heart. Suspicious of their beliefs, he ponders whether to accept the bribe and reveal the group’s secret meeting place or risk his life. Marcus is at a cross roads and must decide once and for all whether he believes. One choice saves his life, the other, his immortal soul.